Turning left past the Corkscrew, we enter Cedar Point's smallest midway, Twister, containing eight adult rides. However, it also provides access to jet skiing, parasailing, access to Kiddy Kingdom, Cedar Point's oldest building, and some wonderful views of Lake Erie. 2008 focused on the families with the addition of Planet Snoopy. With the introduction of a new attraction in 2002, this midway received a new name. For reference, the old name was Oceana Midway. Avast ye land-lubbers. Do ye thinks ye hast what it takes to sail these here waters? Straight ahead, and off the port bow, here be Ocean Motion. Don't be losin' yer lunch here, or you'll be swabbin' the decks, matey! Ocean Motion is a big swinging boat. Be sure to sit on one of the ends for the best ride. Wherever you sit, you'll get a fabulous view of Lake Erie. 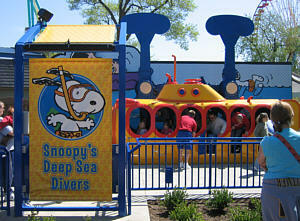 If they are with an adult, this ride will allow smaller sailors. If you were to exit the park gate right here, you would be on the boardwalk next to the Cedar Point beach. Along here, you will find a stand providing access to all sorts of water excitement. You can parasail, jet ski, wind surf, and more. Reservations are recommended. North Coast Parasail is not owned by Cedar Point. For more information, call 419-627-2279. Cedar Point hotel guests get early-bird discounts. 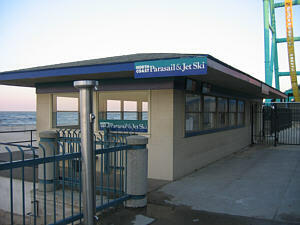 Amusement park admission is not required to visit North Coast Parasail. Whoa, man, like, psychedelic. Check out all the colors! Flippin', eh, man? Is that color scheme like a retro trip from the '60's or what, man? "Chaos must really have me trippin'. Wasn't there another ride here?" As if Chaos doesn't already create enough dizzyness, it had to confuse matters even more. In 2003, Chaos was moved from the Gemini Midway to this location, making room for Top Thrill Dragster. However, that also meant that the previous occupant of this space made a final departure. That ride was Schininnn, er, Schwannnerre, uh. Wait a minute, hang on, I'll get it. Schwabinheimerlichen. No, that's not it. CharlesSchwabinfragilisticexpialidocious. Ooh, that's so close. One more try: Schwabinchen. By George, I think I've got it! Now, if only someone could find a cure... Anyway, the Lady of Schwabinchen spins no more, but Chaos keeps on rockin'. 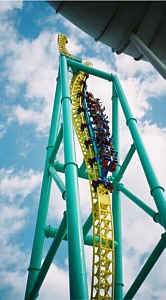 2002 saw the debut of Cedar Point's 15th roller coaster, called Wicked Twister. 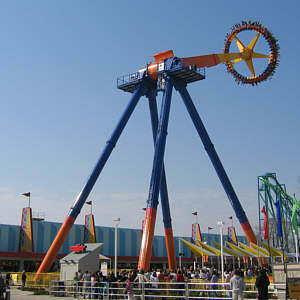 This coaster is an inverted double-twisting double-impulse coaster. What on earth does that mean? Well, the ride is shaped like a really big "U." Each of the arms of the U are twisted. The train is shot forward using magnetic induction, which is the first impulse. It spirals its way up the one end of the U, stalls, then drops back down, where the reverse impulse sends it shooting backwards out of the station, again spiraling its way up, stalling, and dropping forward into the station. From here, a third pulse again sends the train, going even faster, spiraling up the forward arm of the U, where it stalls, and, once again, drops backwards into the station, where it receives a fourth pulse, sending it backwards out of the station and spiraling up the reverse arm of the U. It stalls again, drops forwards into the station, and receives one final pulse sending it spiraling up the forward arm of the U. Again, it stalls, and drops backwards into the station, where it is finally brought to a stop. Whew! The description alone is enough to make a person seasick! If you survived that description, however, then you should know that Wicked Twister, topping out at 215 feet tall, makes Cedar Point the only amusement park in the world with 4 coasters taller than 200 feet! 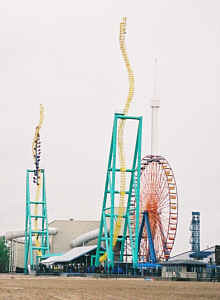 Wicked Twister is the park's third tallest coaster, tied for the park's third fastest coaster, and is the park's fifth tallest ride. Cedar Point's first launched coaster hits a top speed of 72 MPH, which is the same speed as Magnum. Toto, I don't think we're in Kansas anymore. In this storm, each tower twists 450 degrees. In continuing Cedar Point's tradition of record-breaking attractions, Wicked Twister is the tallest and fastest double-twisting impulse coaster in the world. Where's the best place to sit on Wicked Twister? Well, if you're in the very front, you'll experience lots of twisting action when you're thrust into the forward tower, but very little twisting in the reverse tower. You'll also get to see the end of the track as it appears to come perilously close to your seat! That front seat is pretty neat, but, personally, I prefer the back. That seat doesn't get much twisting action on the forward tower, but it twists quite a bit on the reverse tower. While twisting upwards without being able to see the top of the reverse tower, it feels like the train is just going to twist right off the top! It's also quite interesting to look to the left and see the views of Lake Erie and the forward tower as they twist in and out of sight. When riding Wicked Twister, you should be prepared for a bit of exercise. 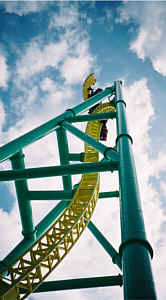 Like Raptor, Wicked Twister is an inverted coaster, meaning that the seats hang below the track. Raptor, however, has a platform that moves up and down to aid riders in getting into and out of the trains. Wicked Twister's platform doesn't move. So, if you're a bit on the shorter side (like me! ), you'll need to hop up into the seat. If you just can't quite make it, never fear. The ride attendants will help give you a boost. If you'd rather do it yourself, start doing those squat thrusts and lots of push ups! Hey, what better motivation to get in shape than to be ready to ride Wicked Twister? You can't be too short for this ride, however. Wicked Twister has a height requirement of 1320.8 millimeters. Gadzooks! Is anyone that tall? Well, sure. In English units, that number converts to a mere 52 inches. Still, that's taller than most of Cedar Point's coasters, but not quite as tall as Raptor or Mantis. In case you're not nervous enough about riding Wicked Twister, take a close look at the two towers after the train has passed by. You'll notice quite a bit of movement! Never fear, however. The ride is designed to allow for quite a bit of swaying in those towers. After all, it's far better to sway than to break! 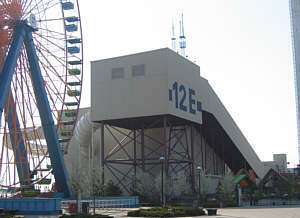 Moving to a new beachfront location for 2000, we see one of the landmarks of Cedar Point, the Giant Wheel. It is still a landmark, but it is now marking a different piece of land. After spending the 1972 through 1999 seasons on the Wildcat Midway, Giant Wheel has been bullied away by Millennium Force. 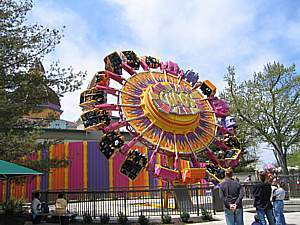 In the process of being moved, however, the ride was given a complete overhaul, so it is now as good as new. From the top of this large Ferris wheel, a spectacular view can be achieved. While the ride requires about 1/2 hour from loading to unloading, it is well worth the time to relax and take in the sights of this beautiful peninsula. Ah, but look out! It's time for another unsubstantiated ghost story! In a park that is as old as Cedar Point, you're bound to have a few spooks around. One of the newer ghost stories belongs to the Giant Wheel. This story was related to me in 1990, when I arrived for my fourth season at The Point. In May, 1990, a teenage couple visited the park, where the girlfriend broke up with the boyfriend. The boyfriend was distraught. He decided to ride the Giant Wheel. While at the top, it seems his loss got the best of him, as he unstrapped his seat belt, opened the door, and jumped to his unfortunate demise. This incident occurred at 12 noon. 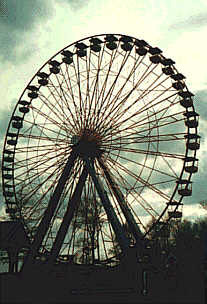 The Giant Wheel operators claim that the ride cannot be run in reverse. Yet, the story goes that the ghost of this jilted lover caused the ride to turn backwards one half turn every day at noon for the rest of that summer, with it still making the occasional backwards half turn to this day. I have, in fact, witnessed this backwards turn on multiple instances. Is it the ghost, or did the operators merely fail to balance the wheel when loading the riders? The world may never know! Just past the Giant Wheel, we come upon Troika. Troika has three spinning wheels attached to a central spinning post, providing some interesting twists and turns. It was this ride that makes me think I must've been a cute kid -- before I obliterated my fear of roller coasters, (meaning I was younger than 15) a couple of college girls asked me if they could take me on Troika. 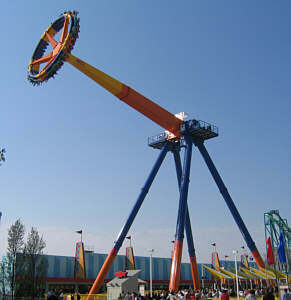 While I liked many of the spinning rides, I'd never gotten up the courage to ride Troika. However, who was I to turn down two very attractive college girls? Sure enough, I rode it with them. Gee, now that I'm older, I can only wish that the girls would approach me like that! It makes me wonder, at what age does a guy go from "cute" to "geeky"? My wife, on the other hand, is probably delighted that the girls aren't asking me to ride Troika with them! I've always wanted to be a ride designer, and Troika provided me with proof that I have the creativity to follow that dream. Way back when I was in elementary school, I thought of a concept that I called the "Triple Ferris Wheel." It started out completely vertical, but I thought that looked clumsy, and would be slow to load. I played with the design, and eventually came up with something that was identical to what is now the Troika. 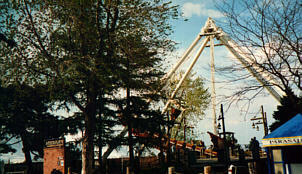 At the time, Troika had not yet been installed at Cedar Point. Someone else just happened to come up with the same design, and managed to sell it to The Point! So, why can't I get a job as a ride designer? Did I hit a peak before high school? For the answers to these and other questions, tune in again in about 40 years! Troika was moved to this location in 2003. 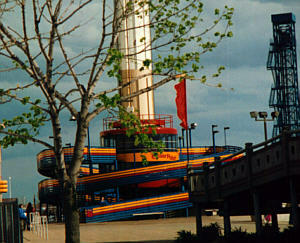 It lost the title to its home on the Gemini Midway by losing a race to Top Thrill Dragster. Silly wheels, thinking they could beat a strata-coaster! Sheesh! Hold on to your hats, because swinging onto the midway in 2005 is maXair. Heck, forget about the hats, this thing'll blow your socks off! This one's not for the weak-of-stomach. Besides having that really big pendulum swinging back and forth, that wheel on the end is also spinning. At its peak, maXair rises 140 feet in the air, then comes whooshing down at 70 miles per hour. Gotta be kind of tall to ride this one, however. Riders must be at least 52" tall to fly into maXair. A little midway rearrangement had to happen in order for maXair to land on this spot. Prior to 2005, this stretch of midway had the "island" games -- games that were in stand-alone booths. Those booths were moved onto the Main Midway, just around the corner. I guess maXair just kind of swept 'em off their feet! That warehouse-like thing is actually another Cedar Point roller coaster. Disaster Transport is an indoor coaster, where the ride is just a bit different every time. You see (well, actually, you don't, 'cause it's inside, but just play along) this ride uses a bobsled-style track, meaning that you aren't riding on any rails. Instead, it's like riding in half a water pipe. On Disaster Transport, you will be flying Dispatch Master Transport to Alaska. Why Alaska? Well, why not? As you go racing through space, you'll narrowly miss asteroids, blown-up ships, and other space debris. Disaster Transport made its debut in 1985, but it looked quite a bit different back then. When it opened, it was known as Avalanche Run. In 1990, the ride was enclosed and rethemed as Disaster Transport to make it more exciting. Sadly, Avalanche Run was a bit of a disappointment. 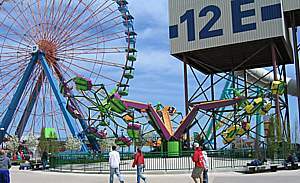 When the ride designer approached Cedar Point, the park was told that this design would give a wilder ride than the Gemini. However, the prototype ride held only 5 people per car, sitting single file. Cedar Point responded that, with millions of guests each year, the ride capacity would need to be larger. 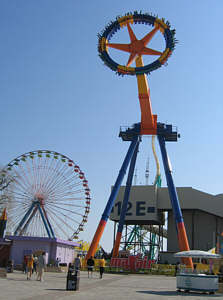 The designer indicated that the cars could be made double-width, providing the same ride excitement. Well, as the opening approached, the wrong cars were sent -- they were only single width. 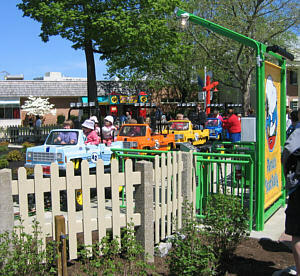 The cars needed to be modified, thereby delaying the ride's opening. The modified cars did not move as well as expected. New cars were brought in for 1986, providing quite a bit of improvement, but the ride still did not live up to the designer's promises. Now that it's enclosed, the ride provides some excitement, especially for those who are new to coaster riding. During the first year that the ride was enclosed, it had some amusing travel posters in the first queue area. I actually miss those posters, indicating areas where people clearly would not want to travel. For example, on a poster of Walt Disney World, a caption was stamped indicating, "The magic is gone." Ooh, that's cold! Well, what do you expect? The ride is heading for Alaska -- it's supposed to be cold! There was also a poster proclaiming, "Baden Baden, No No!" Those are the only posters I can remember right now -- I guess the other posters weren't quite as memorable. Now, the queue area has 3D special effects. If you desire, you can purchase 3D glasses at the entrance to the first queue section. Now we come to Cedar Point's second tallest ride, the Space Spiral. 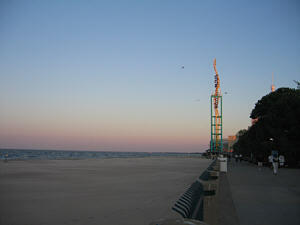 From atop this post, fantastic views of the park, Lake Erie, and the city of Sandusky can be seen. 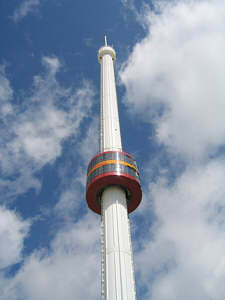 In 1965, Cedar Point announced "New Heights In Fun" when it opened this 330-foot tall tower. 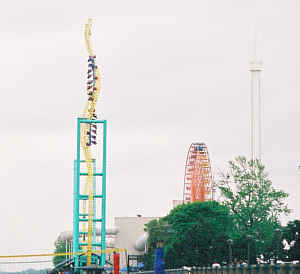 Space Spiral maintained its position as the park's tallest ride until 2003, when Top Thrill Dragster jumped 90 feet higher. In 1985, there were celebrations of "20 years of going up and down, without ever breaking down." Well, that was certainly an invitation for disaster. During that year, the always-reliable Space Spiral broke down constantly, including a ball-bearing failure that caused the ride to be stuck at the top for 4 days. 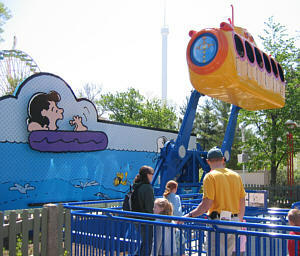 Of course, being sticklers for safety, Cedar Point renovated the ride, getting it back to being reliable. Space Spiral is a fascinating ride to watch when there are high winds. One night, after the park had closed, I stood inside the games area and watched the tip of the ride. It had to have been swinging in excess of 10 feet either side of center. I understand that there was one occasion where the winds were so strong, officials thought the tower was going to snap. They evacuated the entire area around the ride, but, fortunately, the Space Spiral remained standing. When the ride is not running, you may notice that the cab is parked near the center of the tower. Physics majors may want to practice with this one -- the parking location for the cab is the point of least stress for the ride. Here is your homework assignment -- do the math to prove that the approximate center of the tower is the point of least stress. Your assignments are due Wednesday by 3:00. By the way, in the photos, the ride looks a tad bit tilted. Actually, the ride's straight -- it's the photographer who's a tad bit tilted. Good grief, Charlie Brown! That beagle's taking over the planet! 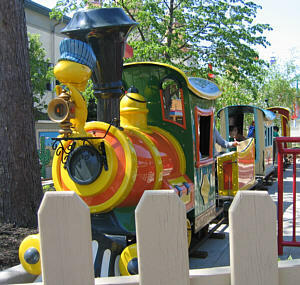 A new area of children's rides opened in 2008. 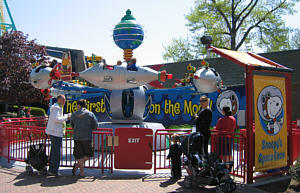 Planet Snoopy went into orbit at the site formerly occupied by Peanuts Playground. 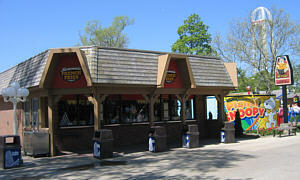 Before the Peanuts came to Cedar Point, this area was occupied by the Berenstain Bears. Going back even farther, this area used to have a miniature golf course and the Giant Slide. 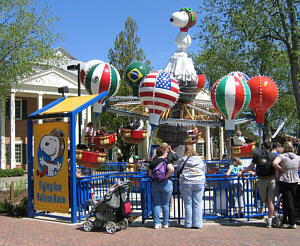 But now, Snoopy rules this part of the park, and he brought seven new rides with him! It was a great year for beagles, as Uno was the first beagle in history to win Best In Show at the Westminster Kennel Club Dog Show. So, naturally, Uno had to be on hand to wish Snoopy all the best with his new Planet Snoopy. 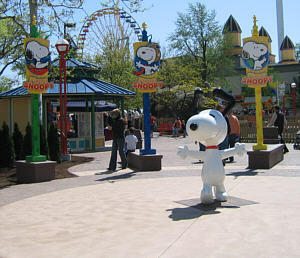 Let's wander around Planet Snoopy by going through the rides in a counter-clockwise circle. We'll enter at the statue of that busy beagle! As if that little bird isn't dizzy enough, the first ride we come to is Woodstock's Whirlybirds. After all this spinning, Woodstock doesn't stand a chance at staying on Snoopy's shoulder! Oh, good grief. It looks like that nasty ol' Kite Eating Tree has once again grabbed Charlie Brown's kite. Well, what we need now are a few kids to try bouncing up and down for a while to see if they can get that kite back for that funny looking kid with the round head! While playing in the park, just be sure to watch out for footballs being held by Lucy! 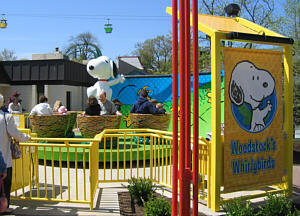 Follow Woodstock's lead, and go for a ride aboard Snoopy's Express Railroad. Hey, Snoopy, do you really know how to drive that train? 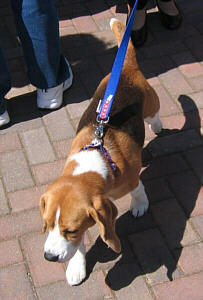 That's one small step for Beagle, one giant leap for Beagle-kind! 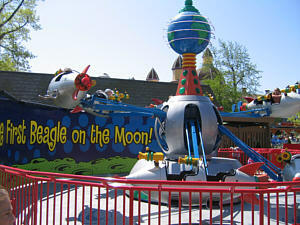 Blast off with America's first beaglenaut on Snoopy's Space Race. Look! Up in the sky! It's a bird! It's a plane! It's a... beagle? See if you can cross the finish line first in the Flying Ace Balloon Race. As can be seen on the right, there's a special feature to be found throughout Planet Snoopy. In all the queues, you'll find a variety of Peanuts cartoons. 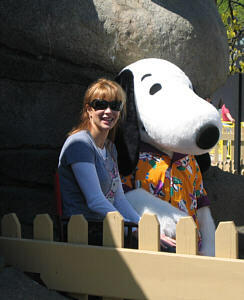 Before giving Woodstock a bit of wind power, I sure hope Snoopy used a breath mint! Load up the truck, and hit the open road! An appropriate way to reach the end of the road in Planet Snoopy is with the Peanuts Road Rally. Just make sure you check the traffic reports before loading up all the luggage. 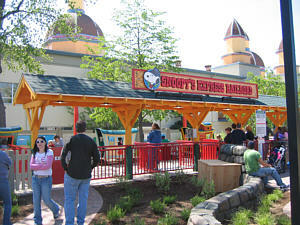 In addition to Planet Snoopy, Kiddy Kingdom runs between the Main Midway and Twister Midway, so the kids have plenty to do. 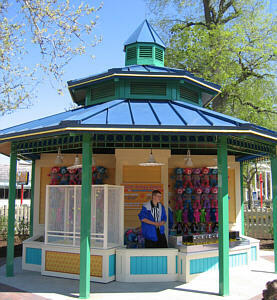 To find out more about Kiddy Kingdom, go back to the Main Midway portion of the tour.. If they are with an adult, the smaller ones can also ride Giant Wheel and Space Spiral. Children between 42" and 54" tall can ride Troika with an adult. Kids between 39" and 48" tall can ride Ocean Motion with an adult. With the addition of Planet Snoopy, there was also an addition to help out the parents. Next to Planet Snoopy, and attached to the First Aid building, is the Family Care Center. This area provides a quiet and private area for nursing mothers. It is also a nice, relaxing, and air conditioned place to rest for a few minutes before heading off for more Cedar Point fun. 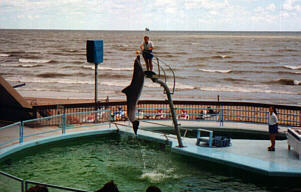 From 1980 through 1997, it was Oceana, hosting a great dolphin show. Then, it became Cedar Point's Aquatic Stadium, featuring a high dive show. In 2008, this building found new life as the Extreme Sports Stadium, featuring All Wheels Extreme. This show, running from May 24 through August 10 (except Mondays and Tuesdays), features skateboarders, rollerbladers, and BMX-style bikers. Looking at a bit of history... 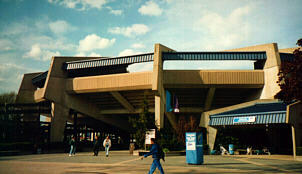 The stadium was originally called Oceana, which is also the old name of this midway. 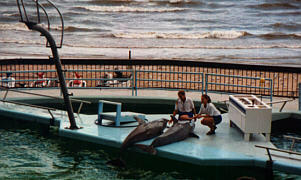 The stadium formerly hosted a dolphin show. Opening in 1980, Oceana, without a doubt, was my favorite Cedar Point show. Now, the only way to view the show is through pictures. 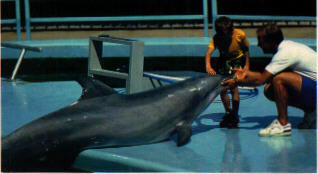 From 1980 through 1996, the introduction said, "Here are our four Atlantic Bottle-Nosed dolphins: Misty, Breeze, Cocoa, and Striker!" Unfortunately, Cocoa and Striker died in August 1996. In 1997, the show continued with Misty and Breeze. Watching this fabulous show, with the breathtaking view of Lake Erie as a backdrop, just made me feel that all was right with the world. During the winter of 1998, however, Misty died. 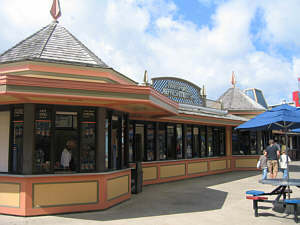 Cedar Point then announced the closing of Oceana, with Breeze being sent to Florida for a much-deserved retirement. 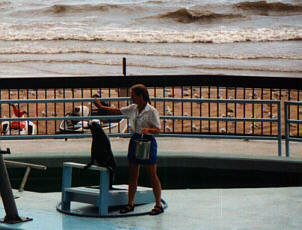 The sea lion in the picture on the left was actually new for 1997, replacing the retired Skipper. She was so energetic, I was really looking forward to watching her develop over the years. Well, the dolphins have waved their final farewell. They gave Cedar Point guests many years of fun and excitement. Such great performers deserve a tribute. I have attempted to provide an adequate remembrance in a poem called Four Finned Friends. This poem can be found on The Poetry Page. You've got easy access to Cedar Point's largest gaming area right here. There are games of all sorts to test your skills, including Whack-a-Mole, Break-A-Plate, Speed Ball, and many more. Pictures of this area can be seen on the Main Midway part of this tour. Additionally, Planet Snoopy has a pair of games, designed specifically for smaller children. Step on up to the lower counters, and let the kids try their hand at some games of skill! When I worked at the park, Cedar Point had an employee Games Night during the summer, where employees competed in teams on a variety of the games. The stipulation is that no more than 4 of the 8 team members can be games employees. Well, one year, my team pushed that rule to the limit. My team consisted of four guessers, the Scales supervisor (who didn't actually count as a games employee! ), another Games supervisor (who also didn't count as a games employee), and two foods workers. Through some, uh, "assistance" from our coworkers, oddly enough, we just happened to win the competition by a long shot. I still have the fruits of my victory, the Stevie Wonder Raisin. Although I think it is actually supposed to be a giant stuffed jelly bean, it looks like a California raisin. Its eyes are missing, hence the name Stevie Wonder Raisin. Stevie is about 4 feet tall, and quite rotund. I selected him due to the popularity of the California raisins in 1988, plus the frequent usage of a particular joke. The joke went like this: "Hey, do you know who's in the park today? Stevie Wonder. Did you see him? No? Well, that's OK, he didn't see you, either." OK, so it's a dumb joke. 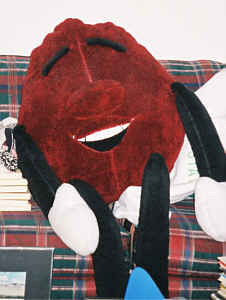 It still helped to define the 1988 season for me, which is why I chose the Stevie Wonder Raisin. When driving home that summer, Stevie was buckled into the front seat of my car. It's always good to have a co-pilot with a sharp eye! It was at that scale where my crew and I came up with the list of reasons why "Stupid People Shouldn't Breathe". This list was highlighted by such things as a woman who, on a rainy day, said, "The weatherman said there was a chance of thunderstorms. He never said it was going to rain." Another woman pointed at the kiddy bumper cars and asked her daughter, "Would you like to ride the pony, dearie?" Now, I've heard of them being called Horseless Carriages, but ponies? One person came up to me while I was at the scale and asked, "Can you tell me where them things are where you get yourself weighed?" Well, I rarely turn away a guess, but in this case, I couldn't resist. I turned, looked at the 8-foot tall scale, turned back to the gentleman, and responded, "I have no idea." I could actually write a whole book on some of the strange, bizarre, and really stupid things people have said and done, but I think you get the idea of why my crew decided that Stupid People Shouldn't Breathe. Pull up a bench, and join Snoopy and Woodstock for a cookie! Or, go on into the Joe Cool Cafe and enjoy a menu that is geared specifically towards the kids. 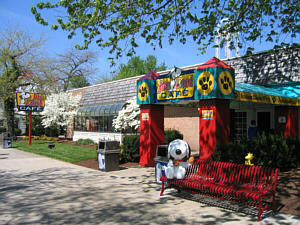 Formerly Macaroni's, the Joe Cool Cafe opened in 2008 as part of the addition of Planet Snoopy. The Joe Cool Cafe is a full service restaurant, so sit down, relax, and enjoy a meal where the kids are in charge. Don't forget to get a dog biscuit cookie! For those who wonder if hi-tech is having an impact on the skills of today's youth, the Joe Cool Cafe provides the answer. There are bathrooms located in this restaurant, located down a hall that's behind a door. While I was sitting in the lobby, a teen walked up, looked at the closed door, and said to me, "OK, now, how does this work?" My response: "Uh, you could try turning the knob and pulling." It occurs to me that I didn't provide instructions for going the other way. I wonder how many hours he stood on the inside, turning the knob and pulling when he should have been pushing. It could explain why the door was propped open the next day. Also along this stretch is the Mr. Potato french fry stand. When I worked at the Oceana Scale, the smell of those french fries kept me constantly hungry! Situated between Mr. 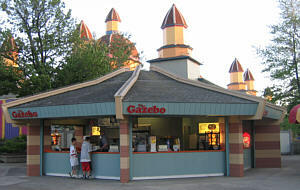 Potato and Chaos is The Gazebo, featuring standard amusement park food. Over by the Space Spiral is Transport Refreshments. Again, it's more standard amusement park food, along with various goodies like taffy, pretzels, etc. Starting in 2006, Transport Refreshments is also offering gluton-free food options. These options are useful for people with Celiac Sprue disease, which, essentially, is an allergy to glutons in items such as wheat. There used to be a shop in this area, but it's gone, now. Sorry about that. You'll just have to settle for the rides, games, and food. This may look like just an ordinary building, but it actually is something special. 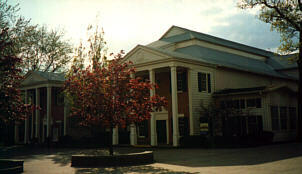 The Cedar Point Grand Pavilion, built in 1888, is Cedar Point's oldest building. The appearance of the building has changed quite a bit since 1888, but the structure is the same. Outside this building, you will find a plaque dedicated to Helen Keller. In 1925, Keller addressed 7500 people from the Lions Club national convention, challenging them to establish a commitment to help prevent blindness and promote healthy eye care. The speech she made here helped start a world-wide crusade for saving sight.